Lost to translations and god men, epics have often been misconstrued at the hands of perpetrators. It comes as a no brainer, however, that all the pious texts, in essence speak of the same human values. Once in a while, we also come across tales concocting humans and animals in a benign light. That for me is the best that there’s to religions. 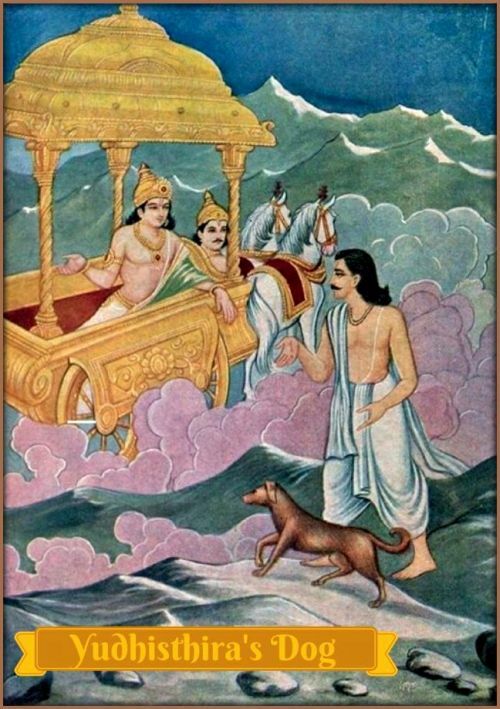 Yudhisthira’s dog – Tale from Mahabharat. ~Image sourced from Internet. The Indian Pariah Dog, considered by scientists to be the first truly domesticated dog features in the great Indian epic Mahabharat. The closing chapter narrates the tale of King Yudhisthira and his brothers (The Pandavas) making a pilgrimage to their final resting place. Our in-house expert, his highness Chunnu present Yudhisthira’s dog – Tale from Mahabharat. The Pandavas were firm in their resolve to renounce their Kingdom and began the ascent of a mountain as part of their final journey. Yudhisthira led the way followed by Bheema, Arjuna, Nakula, Sahadeva and Draupadi. A dog also accompanied them through their journey. The first to fall along the way was Draupadi (Yajnaseni). The next to falter and collapse was Sahadeva. “What wrong did Arjuna do, O Yudhisthira?” cried Bheema, overcome with grief. Bheema fell thereafter, unable to bear the sorrow of seeing his brothers die. And now only Yudhisthira and the dog were left, continuing the journey together. And finally, Indra descended in his chariot. He praised the extraordinary qualities of Yudhisthira and invited him into the chariot to ascend to heaven. And so he turned back. And indeed, the dog had transformed into the God of Dharma and blessed Yudhisthira for his complete lack of selfishness and dedication to righteousness in all circumstances. And thus rose Yudhisthira to heaven in the chariot of Indra.